The best thing about living on Thomas Point Road is the close proximity to the shoal. A miserable winter has been followed by an equally miserable spring. We had 4 solid days of torrential rain last week, so I figured it would be the end of May before the bite would turn on. I have hit the shoal as often as the weather permitted, but have not even seen a baitfish. My friend Jeff from work asked me to take him and his buddy Bob fishing on Saturday. I was actually dreading the outing, since I had yet to even catch a dink. The trollers have been doing well, but the thought of light tackle with plugs and plastics seemed like trying to find a needle in a haystack. It was a nice day with a light breeze and sunny skies. We left the dock around 8 am and anchored up at "the spot". There has been an ongoing argument on Tidal fish about spot burning. 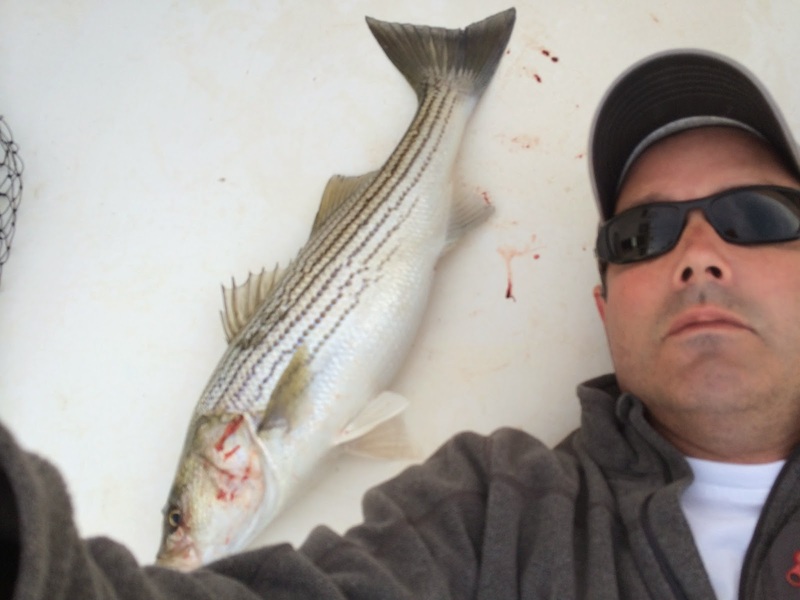 Readers of this blog know that I am more than willing to do the work, so that those who can only get out periodically, can enjoy the splendor of a striper exploding on a plug. 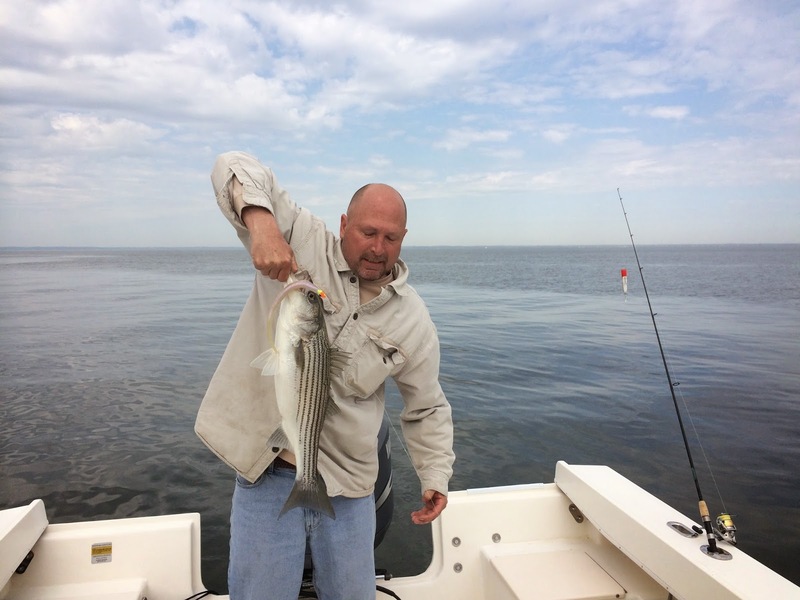 Striper fishing is not like fishing for largemouths. The fish are constantly on the move, so the idea of burning a spot, is really no big deal. It's all about patterns. Thomas point shoal is quite large, so its more important to adjust your position to both underwater rock structures and the movement of the tides. One of the guys who fishes the rock pile that I frequent, went so far as to place a marker right on the rock pile. It really does not bother me one bit. I will admit that it can get a bit crowded in Sept and Oct , but I love watching others get their first blowup. So anyway, after a solid hour of casts, I decided to shoot across the bay to give Poplar Island a try. The tide finally started moving around 11 and Bob immediately picked up a nice 26 filled with eggs. We were about 30 yards off the rocks in 10 feet of water on the north shore using 9 inch BA's with a 3/4 ounce candy colored jig head. That was it for the day. Still I was thrilled to get the skunk off the boat. I left the dock at 5:30 tonight. Low tide was predicted for 6:30. Since the tide was barely moving, I never dropped anchor and moved around quite a bit. Fished just about every point up the South River as far as the Rt. 2 bridge. Again, not even a baitfish. As the sun was setting, I made my way back to the shoal. 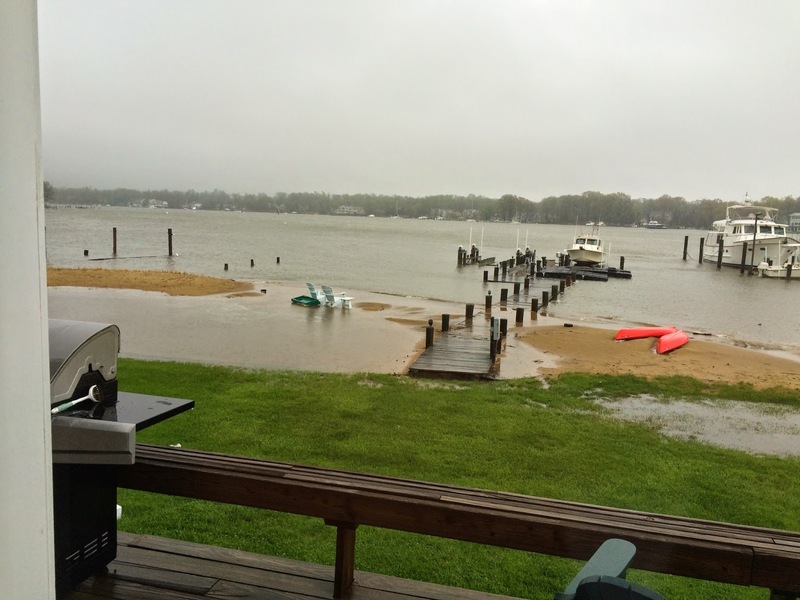 The tide was still going out, so I moved north of "the spot" and drifted south. Amazingly, just as I hit the spot where I normally anchor, a huge Mama slammed Papa Dogg, and I finally boated my first fish of the year....a good month and a half late.